It’s impossible not to take the tone of that concept through the rest of the day, which included screenings of Paul Weitz’s “Grandma,” Michael Polish’s “Northfork” and Carol Reed’s “The Third Man.” Part of the concept of empathy which we discussed in the morning (I sat on the panel with Guillermo Del Toro, Paul Cox, Michael Polish, Paul Weitz, and others) is the idea that film is transportive—we go to places we wouldn’t otherwise go and see lives we wouldn’t otherwise see. The sense of a cinematic journey was evident in today’s trio of films, taking us from present day L.A. to a 1950s Montana that feels even more displaced from time to a major European city ravaged by World War II. On paper, the trio seems to have nothing in common, but Ebertfest engenders a sense of community so strong that all cinema falls underneath one umbrella. It is all a journey. It is all empathetic. It is all essential. After the panels, the day’s film program started with a lively, engaged audience willing to go on the journey with Elle (Lily Tomlin) and her granddaughter Sage (Julia Garner) in Paul Weitz’s nuanced “Grandma.” Seeing it again on the larger-than-imaginable Virginia Theatre screen in Champaign-Urbana, I was struck by the easy, uncomplicated flow of the 79-minute film, and Weitz detailed in his Q&A after the screening (with producer Andrew Miano guesting as well) that the first thing they cut in the editing process was anything that felt too much like it was a going for a laugh. There’s no desperation in “Grandma”; no eagerness to please; no political statement to make. It is a character study of two women at very different turning points in their life, and an insightful example of how those moments never stop coming whether one is a teenage girl needing an abortion or her grandmother needed to write another chapter in how she’s dealing with grief. Weitz spoke at length about how much of the process of “Grandma” he handed over to his actors, especially Tomlin, whom he basically allowed to guide the production in a way that made the film feel both her own and honest. He went as far as to say sometimes that his role as a director is more similar to the Hippocratic Oath—“Do No Harm” and just let things happen—especially in the already-famous mini-movie-within-a-movie co-starring Sam EIliott, which he compared to a Harold Pinter play. So much of how that scene unfolded was serendipitous, almost coming organically on the set, and Weitz claimed it was just about being in the right shot while it was unfolding. Near the end of Weitz’s Q&A, he spoke about how much of the film is about grief—how do you get past loss? Of course, grief and loss are elements of Michael Polish’s “Northfork” as well, even though the film (which was shown in a glorious 35MM print) couldn’t really be much more different on paper. And yet listening to Willis (Mark Polish) and his father (James Woods) discuss whether or not to excavate the body of his mother, I was struck by the unexpected dilemma that initiates “Grandma.” Life (and even death) often doesn’t work out as planned. And film makes us empathetic to that fact. We all deal with the unexpected. Seeing “Northfork” for the first time over a decade, I was struck by the film’s ambition. Even in today’s cinema in which Malick clones are more common, it feels distinctive, a fact enhanced by a unique look that even Polish admitted makes it look much older than 13 years. It is a film that Roger argued owes a debt to Terence Malick—and the vistas recall “Days of Heaven”—but it is also a deeply personal film for Polish, who told Matt Zoller Seitz in a Q&A that it was the first script he wrote with his brother, and the project was designed and put together by family members. His father built most of the sets in the harsh Montana landscape that Polish remembered from his youth (and still calls home). The story of a small town being evacuated so it can be flooded to create a lake has a fascinating air of the inevitable. Roger said in a clip that played before it that the waters are rising for us all, and there’s something fascinatingly relatable about this world that is technically so alien from us all, which is the key to empathy. We may not be evacuating our homes, but the march of time always stops for massive changes and “Northfork” captures something intrinsic about how we leave parts of our lives behind—or even this world behind when we die. It is about transition, something we will all experience in several forms over the course of our lives, and it is as ambitious a film as is contained in this year’s entire program. Polish also spoke personally about Roger’s impact on him, telling a great story about how hard it was to concentrate on the day he knew that Roger was watching his debut, “Twin Falls, Idaho.” While his father tried to get him to go to Home Depot and continue “sweating pipes” (they were working on a house), Polish couldn’t concentrate, even hearing the fax machine with the notes about Ebert’s opinion on the film spitting out as he was working underneath his house. He introduced the film with a similar anecdote about when “Northfork” premiered at Sundance. The admittedly slow film was met with silence when it ended, and Polish said that Roger came down the aisle, looked at him and said they were going to breakfast the next day. Whether he liked or hated his films, Roger inspired Michael to “just keep filming.” The work is what matters. There’s no work quite like Carol Reed’s “The Third Man,” presented last night in a glorious 4K restoration that made it feel somehow new despite having seen it multiple times. Accompanying the film to Ebertfest was Angela Allen, a script supervisor on the movie, who went on to work for decades in cinema, including collaborating on every John Huston film. Only 19 on the set of “The Third Man,” the now-86-year-old told amazing stories after the screening in a Q&A moderated by Michael Phillips and Nate Kohn. 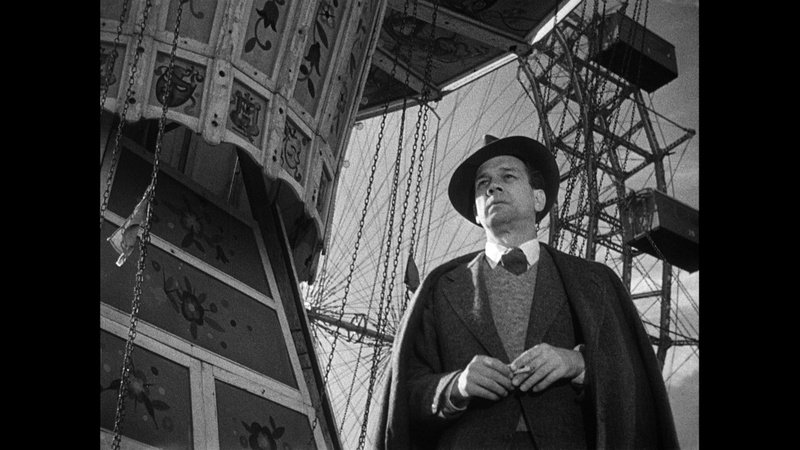 Essentially, “The Third Man” is a film birthed from Reed’s unbelievable talent, but also from a time and place that couldn’t be replicated. It would be impossible to remake the film because one couldn’t capture Vienna right after World War II, which is a character in the film. Even the notable zither score, which Phillips told the audience was actually #1 on the hit parade for 11 weeks, was almost accidental, as Reed stumbled upon the zither player in a café. Kohn commented that when he lived in London and Paris, several people claimed they took Carol Reed to that café to hear the zither. Before that Q&A, “The Third Man” entranced its audience as it does every time its screens. One of Roger’s top ten films of all time, Reed’s thriller still has an amazing power to capture viewers, keeping them as on their toes as its protagonist, the confused Holly Martins (Joseph Cotton), a man immediately thrown off his axis (as represented by the film’s daring angles) when he arrives, finds himself in a world he doesn’t understand. His friend, Harry Lime (Orson Welles) was killed in an accident just before he arrived. Or was he? “The Third Man” is a great example of how a film can replicate its central character’s sense of confusion. He is constantly yelled at in a language he doesn’t understand (and isn’t subtitled) and even simple conversations are filmed at canted angles, designed to show a world askew. And then there’s the imagery. The final act of “The Third Man” contains some of my favorite visuals of all time, from Holly’s meeting with Harry (and it’s world spinning outside) to the shadows in the sewers to one of my favorite endings of all time. Allen spoke about that ending, noting that they reshot it several times and Reed asked Alida Valli to start her walk further back every time, going with the final take and the longest walk. She also told amazing stories about Orson Welles, adamantly denying his claims that he actually directed the film. From the sound of it, he was more difficult than involved. On the first day in Vienna, he went down to the sewers to find the crew eating bacon sandwiches in the unhygienic shooting location. He was so disgusted that he refused to go down there again, meaning that a lot of the shots in the climax of “The Third Man” are not actually Welles, and the ones that do contain him were done on a set in London. Before “The Third Man,” Chaz and Michael Phillips introduced the Ebert Fellows, students writing about Ebertfest, and it was a great inclusion on the first full day. Everything comes full circle. From a 1949 thriller to a 2015 dramedy; from Roger’s writing to a new generation. The journey never stops.